Composed by Irving Berlin. Arranged by Kirby Shaw. Choral. A Cappella, Jazz, Ballad, Standards. Octavo. 8 pages. 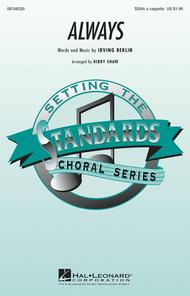 Published by Hal Leonard (HL.8748330). Recorded by hundreds of major artists over the years, the classic simplicity of this Irving Berlin song makes it one of our most treasured standards. This expressive a cappella setting for women's voices will create a magical moment in performance! Available separately: SSAA. Duration: ca. 2:10. This is a very nice arrangement, It's a sweet close harmony, that sings softly, and is easy listening. It's not that hard to practice and very nice to sing, hear and perform.. I'm loving it. would be the absolute perfect piece to sing! It is phenomenal! A masterpiece! 20 of 38 people found this review helpful.